If the students in your youth group are anything like me, character building is not high on their priority list. I want to push a button and instantly be more loving, patient, and kind. In fact, I often resist the very circumstances that God puts in my path in order to shape and mold me to become more like Jesus. I’m guessing your students do the same. I remember my first year of marriage.. I thought being married would be so awesome! I loved God, she loved God, we loved each other – how hard could it be, right? Ha…did I have a rude awakening! My first year of marriage was brutally tough! Mostly because I thought I had it all together, but in reality I had A LOT of growing up to do. But with God’s help, we got through that first year. God used that first year of marriage (and the 11+ years that followed) as a way to build my character. At times, I was willing to let God shape and mold my character. And of course there were many times I wasn’t willing to go along with what God was doing. But if you think about it, that’s often how God changes us. He uses circumstances in our lives as a way to form His character in us. Use this lesson to help teenagers get this truth. Enjoy! 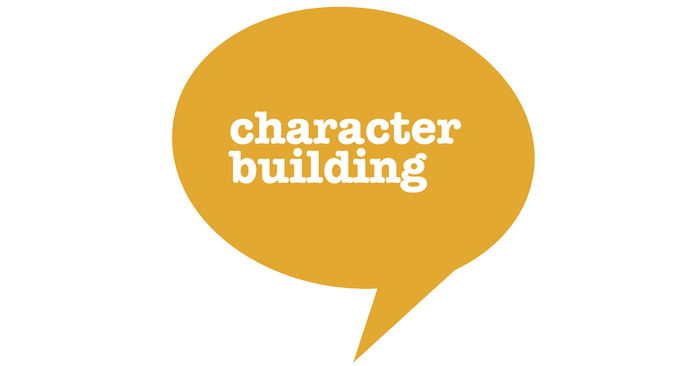 Use this lesson to show your youth group that every situation they go through can be an opportunity to build some type of character. If they rely on God, He will help them develop good character. Before the game begins, lay down a tarp or a towel on the ground. Select two students to wear the t-shirts. Once the have put them on over their clothes, blindfold them and have them stand on the tarp or the towel. Split the rest of the group into two teams and assign a team to each blindfolded student. Give the teams the paint and paintbrushes. Let the students take turns putting different colored paints on a brush and then stand with the brush almost touching the blindfolded student. Call out a command that will make the blindfolded students move, such as spin around three times! As the blindfolded students move, they will bump into the paintbrush, causing paint to get on the shirts. When it’s the next student’s turn, call out another command, like do five jumping jacks! Continue this until all the students have had a chance to hold the paintbrush. Have a leader carefully remove the t-shirts from the students wearing them. Lay them on the tarp. Have the two students remove their blindfold and decide which shirt looks the coolest and should win! Would the shirts have gotten any paint on them if the students who were blindfolded never moved? Would they have moved if I hadn’t called out things for them to do? Did they know why I was telling them to move around? You guys actually came up with some pretty cool t-shirt designs! It would have been too easy to let you guys just paint the shirts, so I decided to make it more interesting and have them be blindfolded. While it would have been easier for them to just stand there wearing their t-shirts, the end product wouldn’t have looked as cool! Even though they didn’t know why they were moving around and doing all the things I was saying, they were actually creating something really awesome! They were blindfolded, so they didn’t know what was going on. But by walking through the motions I called out, they were transforming something very plain into something very colorful. Don’t get me wrong; I love this verse. But wouldn’t it be nice and so much easier if it just said, “God will give you character and hope” instead of that our sufferings produce perseverance, which produces character? But that’s not the way it works. See, every single thing you go through produces some type of character. We started the game with two white shirts. And if you guys want have wanted to, you could have ignored my instructions. If you had ignored me, you still would have had the shirts when the game was over. They just wouldn’t be as colorful! With every situation in life that you walk through, it will build your character in some way. You can choose to walk through times of suffering leaning on God, obeying and trusting Him, and that will produce good character, character that leads to hope. Or you can try to get through hard times all on your own, ignoring God completely. That will produce a character that’s hard, isolated, and jaded. That kind of character is hopeless. Which sounds like the type of character you would rather have? Have you ever been through a hard time that made your character better? Do you think it’s possible to persevere through times of suffering without God? Would you rather have a character that came from God and produces hope, or a character that you developed on your own that is hopeless? Just like this verse talks about, you are going to go through times of suffering in your life. There’s no way to avoid that. But if you persevere through them, that’s when good character is made. So how do you persevere? You turn to God for strength and guidance. You ask Him to help you persevere through the hard, suffering times so that you can develop good character. If you turn to Him, God will help you. But He doesn’t make you turn to Him. In fact, if you want to, you can ignore Him completely, trying to get through everything on your own. But that will only make the times of suffering even harder. Or, you can turn to Him, have Him walk you through the hard times, and develop amazing character in the process. It’s your choice. I think the choice is pretty clear. Don’t you? ← Bribe Your Youth Group – Are Prizes or Incentives a Good Idea? thank you so much for sending me free lessons. The lessons are very useful and applicable. May the Lord continue to expand your ministry and continue to bless you with wisdom . So happy to help your ministry! I have a small group of 3 boys, do you have lessons for these type of small groups? Hi Kim, Our lessons can be modified for any size group, that’s the beauty of how we write our material for leaders and students. Hi Grace, Thank you so much for the positive feedback. We love to hear stories about how our lessons are impacting others and their ministry with students. God Bless! Hi Maureen, on our website http://www.ministrytoyouth.com, we have free lessons under LESSONS. Check out those! I feel like you can find a lesson that will relate to what you guys are going through with your youth. GOD BLESS!